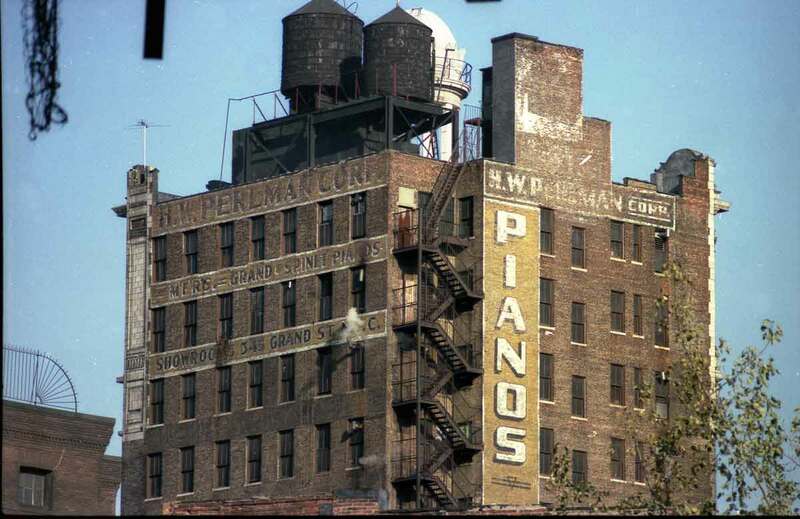 Showrooms 345 Grand St. N. Y. C.
The H. W. Perlman piano factory was located in the Jarmulowsky's Bank building approximately 1948 to 1964. These dates are very approximate. My only evidence for this time period is the Manhattan telephone directory which listed them here during this time. H. W. Perlman Pianos began as Perlman & Rosansky in 1902, the partners being Harry Wolf Perlman (1874-1966) and Louis Rosansky (1874-1931). Both were immigrants from Russia, who arrived in New York in the 1890s. Their partnership ran approximately 1902 to 1907, when they were located in the 4xx block on Grand St. near Clinton, Pitt and Ridge Sts., downtown on New York's East Side. Harry W. Perlman was first listed in the New York telephone directory in 1906 at 414 Grand St. near Clinton St. This was the address of the Perlman showrooms until 1922. In 1923 this address changed to 345-347 Grand St. 345-347 Grand St. is a 5-story cast iron building, which, according to streeteasy.com "opened in December, 1888 as the Grand Street Museum." This was Perlman's showroom and retail outlet (for pianos and other furniture) from 1923 through 1965. In 1935 H. W. Perlman bought the building at 345-347 Grand St. As reported in the New York Herald Tribune, 4 May 1935, pg. 26, "The H. W. Perlman Corporation, dealer in pianos and furniture, has bought the five-story building at 345-347 Grand Street, between Ludlow and Essex Streets, from Celia Schwarz, Rose Hahn and Jessie David, for a reported price of about $56,000. The property comprising a plot 44 by 74, is assessed at $78,000." In 1960 this story of the Perlmans' 65th wedding anniversary appeared in the New York Herald Tribune: "Surrounded by their large family in a room full of flowers Mr. and Mrs. Harry W. Perlman yesterday celebrated their sixty-fifth wedding anniversary in the house at 822 E. 19th St., Brooklyn, where they have lived for forty years. Mr. Perlman, a maker and seller of pianos since 1898, wore a white carnation in his buttonhole. His wife wore an orchid. On the front porch the family talked gaily. There were many good things to eat. 'No' said Mr. Perlman, who is eighty-four, 'I don't think I would do it all over again.' His wife, sitting next to him, smiled. Mr. Perlman qualified his remark. He meant his early life, he said, before he got married. Asked what it was like to have been married sixty-five years, Mr. Perlman said, 'You live. It happens. That's all there is to it.' Numerous congratulatory cards and presents, among them a letter from Gov. Rockefeller and a telegram from Mayor Wagner, decorated the piano. The Perlmans have four children, ten grandchildren and ten great-grandchildren, many of whom came to supper at 6 p.m. They brought presents and laughter. Mr. Perlman maintains a piano store on Grand St. in New York and a factory on Canal St. He said the store at 345 Grand St., which has been there since he started in 1898, is the oldest store in that part of the city." Harry Perlman's obituary in the New York Times, 2 April 1966, read, "Harry W. Perlman, who owned the H. W. Perlman piano manufacturing company at 54 Canal Street and its retail outlet at 345 Grand Street for many years, died yesterday in his home at 1199 Park Avenue. His age was 95. Mr. Perlman formed the company in 1898, and they were dissolved early this year. He had also been a film industry pioneer, president in the nineteen-twenties of B. P. Schulberg Productions. Its actors included the late Clara Bow. Mr. Perlman was one of the original investors in Century Theaters, the Brooklyn and Long Island chain. Until recently, he had lived in Brooklyn and was a trustee of Temple Beth Emeth of Flatbush. A son, William; 3 daughters, Miss May Perlman, Mrs. Anne Abramowitz and Mrs. Milton Jones; 10 grandchildren and 12 great-grandchildren survive." This ad for Perlman Pianos appeared in the New York Times, 17 Oct. 1936, pg. 3. This ad for Perlman Pianos appeared in the New York Times, 19 Jan. 1947, pg. 29. These ads set the Perlman Piano establishment date at 1899, but even this seems a bit too early. Harry Perlman appears in the 1900 U. S. Census, age 24, living at 13-15 Attorney St., when his occupation was "tailor." His naturalization petition dated 7 Jan 1899 also gave tailor as his occupation.